It opens a GUI that steps you through each conflict, and you get to choose how to merge. Sometimes it requires a bit of hand editing afterwards, but usually it's enough by itself. It is much better than doing the whole thing by hand certainly. The command doesn't necessarily open a GUI unless you install one. Running git mergetool for me resulted in vimdiff being used. You can install one of the following tools to use it instead: meld, opendiff, kdiff3, tkdiff, xxdiff, tortoisemerge, gvimdiff, diffuse, ecmerge, p4merge, araxis, vimdiff, emerge. This will set vimdiff as the default merge tool. You can navigate among these views using ctrl+w. You can directly reach MERGED view using ctrl+w followed by j.
git clean Remove extra files (e.g. *.orig) created by diff tool. I find merge tools rarely help me understand the conflict or the resolution. I'm usually more successful looking at the conflict markers in a text editor and using git log as a supplement. The middle section is what the common ancestor looked like. This is useful because you can compare it to the top and bottom versions to get a better sense of what was changed on each branch, which gives you a better idea for what the purpose of each change was. If the conflict is longer, then I will cut and paste each of the three sections into three separate files, such as "mine", "common" and "theirs". This is not the same as using a merge tool, since a merge tool will include all of the non-conflicting diff hunks too. I find that to be distracting. Somebody already mentioned this, but understanding the intention behind each diff hunk is generally very helpful for understanding where a conflict came from and how to handle it. This shows all of the commits that touched that file in between the common ancestor and the two heads you are merging. (So it doesn't include commits that already exist in both branches before merging.) This helps you ignore diff hunks that clearly are not a factor in your current conflict. Verify your changes with automated tools. Plan ahead; communicate with co-workers. Planning ahead and being aware of what others are working on can help prevent merge conflicts and/or help resolve them earlier -- while the details are still fresh in mind. For example, if you know that you and another person are both working on different refactoring that will both affect the same set of files, you should talk to each other ahead of time and get a better sense for what types of changes each of you is making. You might save considerable time and effort if you conduct your planned changes serially rather than in parallel. For major refactorings that cut across a large swath of code, you should strongly consider working serially: everybody stops working on that area of the code while one person performs the complete refactoring. If you can't work serially (due to time pressure, maybe), then communicating about expected merge conflicts at least helps you solve the problems sooner while the details are still fresh in mind. For example, if a co-worker is making a disruptive series of commits over the course of a one-week period, you may choose to merge/rebase on that co-workers branch once or twice each day during that week. That way, if you do find merge/rebase conflicts, you can solve them more quickly than if you wait a few weeks to merge everything together in one big lump. If you're unsure of a merge, don't force it. Merging can feel overwhelming, especially when there are a lot of conflicting files and the conflict markers cover hundreds of lines. Often times when estimating software projects we don't include enough time for overhead items like handling a gnarly merge, so it feels like a real drag to spend several hours dissecting each conflict. In the long run, planning ahead and being aware of what others are working on are the best tools for anticipating merge conflicts and prepare yourself to resolve them correctly in less time. Identify which files are in conflict (Git should tell you this). Open each file and examine the diffs; Git demarcates them. Hopefully it will be obvious which version of each block to keep. You may need to discuss it with fellow developers who committed the code. Once you've resolved the conflict in a file git add the_file. Once you've resolved all conflicts, do git rebase --continue or whatever command Git said to do when you completed. Merge conflicts happens when changes are made to a file at the same time. Here is how to solve it. Note the list of conflicted files with: git status (under Unmerged paths section). 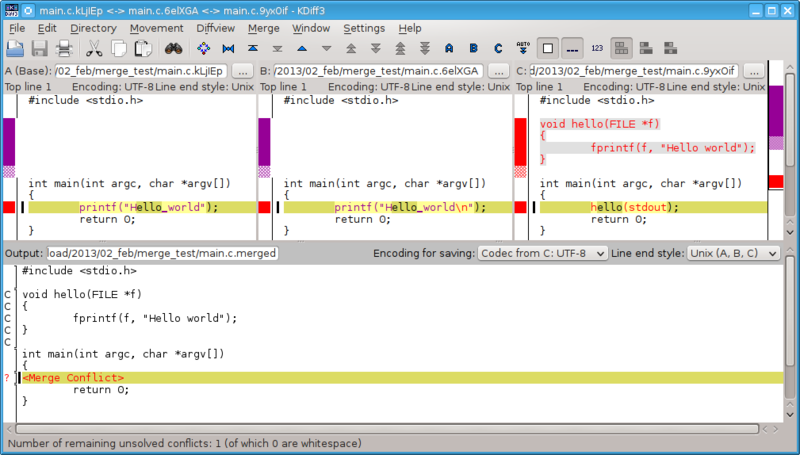 Use GUI to solve the conflicts: git mergetool (the easiest way). To accept remote/other version, use: git checkout --theirs path/file. This will reject any local changes you did for that file. However you've to be careful, as remote changes that conflicts were done for some reason. Related: What is the precise meaning of "ours" and "theirs" in git? Edit the conflicted files manually and look for the code block between <<<<</>>>>> then choose the version either from above or below =====. See: How conflicts are presented. Path and filename conflicts can be solved by git add/git rm. Finally, review the files ready for commit using: git status. If you still have any files under Unmerged paths, and you did solve the conflict manually, then let Git know that you solved it by: git add path/file. If all conflicts were solved successfully, commit the changes by: git commit -a and push to remote as usual. 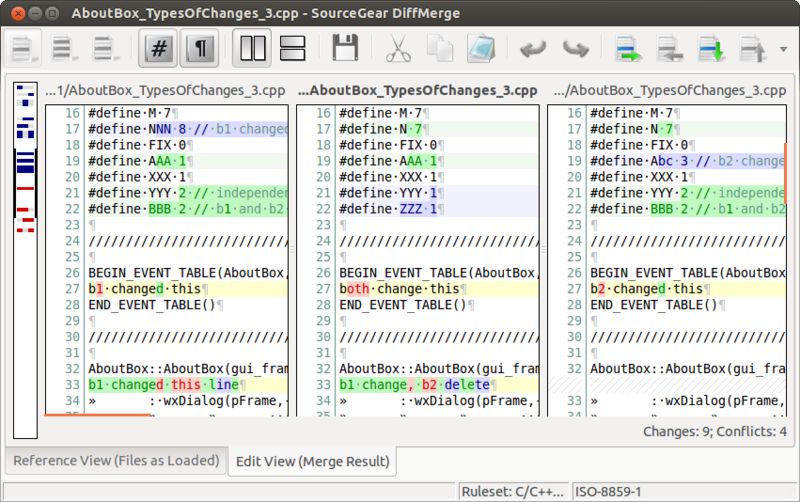 I've successfully used DiffMerge which can visually compare and merge files on Windows, macOS and Linux/Unix. It graphically can show the changes between 3 files and it allows automatic merging (when safe to do so) and full control over editing the resulting file. ⌘-Alt-Up/Down to jump to previous/next changes. Alternatively you can use opendiff (part of Xcode Tools) which lets you merge two files or directories together to create a third file or directory. If you're making frequent small commits, then start by looking at the commit comments with git log --merge. Then git diff will show you the conflicts. For conflicts that involve more than a few lines, it's easier to see what's going on in an external GUI tool. I like opendiff -- Git also supports vimdiff, gvimdiff, kdiff3, tkdiff, meld, xxdiff, emerge out of the box and you can install others: git config merge.tool "your.tool" will set your chosen tool and then git mergetool after a failed merge will show you the diffs in context. Each time you edit a file to resolve a conflict, git add filename will update the index and your diff will no longer show it. When all the conflicts are handled and their files have been git add-ed, git commit will complete your merge. See How Conflicts Are Presented or, in Git, the git merge documentation to understand what merge conflict markers are. You can also read about merge conflict markers and how to resolve them in the Pro Git book section Basic Merge Conflicts. shows all files which require conflict resolution. This will open three buffers (mine, theirs, and the output buffer). Navigate by pressing 'n' (next region), 'p' (prevision region). Press 'a' and 'b' to copy mine or theirs region to the output buffer, respectively. And/or edit the output buffer directly. I either want my or their version in full, or want to review individual changes and decide for each of them. git commit -m "merged bla bla"
Review changes and accept either version for each of them. Default mergetool works in command line. How to use a command line mergetool should be a separate question. It will open local version (ours), "base" or "merged" version (the current result of the merge) and remote version (theirs). Save the merged version when you are finished, run git mergetool -t meld again until you get "No files need merging", then go to Steps 3. and 4.
to resolve changes in favor of the other or the main repository. and after finishing a file, you will have to save and close, so the next one will open. This above command is the most useful command in my git life which saved a lots of time. Before pushing your newly committed change to remote server, try git pull --rebase rather git pull and manual merge and it will automatically sync latest remote server changes (with a fetch + merge) and will put your local latest commit at the top in git log. No need to worry about manual pull/merge. You could fix merge conflicts in a number of ways as other have detailed. I think the real key is knowing how changes flow with local and remote repositories. The key to this is understanding tracking branches. I have found that I think of the tracking branch as the 'missing piece in the middle' between me my local, actual files directory and the remote defined as origin. I've personally got into the habit of 2 things to help avoid this. a) All new/changed files get added and that might include some unwanted changes. b) You don't get to review the file list first. git commit # Then type the files in the editor and save-quit. This way you are more deliberate about which files get added and you also get to review the list and think a bit more while using the editor for the message. I find it also improves my commit messages when I use a full screen editor rather than the -m option. because pull implies a merge and if you have changes locally that you didn't want merged you can easily end up with merged code and/or merge conflicts for code that shouldn't have been merged. git rebase --hard origin/master # or whatever branch I want. CoolAJ86's answer sums up pretty much everything. In case you have changes in both branches in the same piece of code you will have to do a manual merge. Open the file in conflict in any text editor and you should see following structure. Choose one of the alternatives or a combination of both in a way that you want new code to be, while removing equal signs and angle brackets. Does not seem to always work for me and usually ends up displaying every commit that was different between the two branches, this happens even when using -- to separate the path from the command. Replacing $MERGED_IN_BRANCH with the branch I merged in and [path] with the file that is conflicting. This command will log all the commits, in patch form, between (..) two commits. If you leave one side empty like in the commands above git will automatically use HEAD (the branch you are merging into in this case). This will allow you to see what commits went into the file in the two branches after they diverged. It usually makes it much easier to solve conflicts. Thus, if you don't want to use the command-line or any 3rd party tools that are offered here from older answers, go with GitHub's native tool. This blog post explains in detail, but the basics are that upon 'merging' two branches via the UI, you will now see a 'resolve conflicts' option that will take you to an editor allowing you to deal with these merge conflicts. I'm surprised no one else spoke about resolving conflict using patience with the merge recursive strategy. For a big merge conflict, using patience provided good results for me. The idea is that it will try to match blocks rather than individual lines. be merged have diverged wildly. I always follow the below steps to avoid conflicts. Now you can do the same and maintain as many local branches you want and work simultaneous my just doing a git checkout to your branch when ever necessary. Step 3: If there are some conflicts, go to these files to modify it. Step 7: And then there is no conflict between test and master. You can use merge directly. When running "git fetch" and then "git merge"
When running "git fetch" and then "git rebase"
When running "git stash pop"
BTW if you install Git Extensions there is an option in its setup wizard to install Kdiff3. $ git config --global --add mergetool.kdiff3.path "C:/Program Files/KDiff3/kdiff3.exe"
$ git config --global --add difftool.kdiff3.path "C:/Program Files/KDiff3/kdiff3.exe"
Then it opens the Kdiff3, and first tries to resolve the merge conflicts automatically. Most of the conflicts would be resolved spontaneously and you need to fix the rest manually. Then once you're done, save the file and it goes to the next file with conflict and you do the same thing again until all the conflicts are resolved. This answers is to add an alternative for those VIM users like I that prefers to do everything within the editor. Tpope came up with this great plugin for VIM called fugitive. Once installed you can run :Gstatus to check the files that have conflict and :Gdiff to open Git in a 3 ways merge. Once you are finished merging the file, type :Gwrite in the merged buffer. Vimcasts released a great video explaining in detail this steps. I hope that this will help every one concerning this issue. And there are many features you can check them here. Try Visual Studio Code for editing if you aren't already. What it does is after you try merging(and land up in merge conflicts).VS code automatically detects the merge conflicts. current change(meaning original one before merging)'?. It helped for me and it can work for you too ! PS: It will work only if you've configured git with with your code and Visual Studio Code. A safer way to resolve conflicts is to use git-mediate (the common solutions suggested here are quite error prone imho). See this post for a quick intro on how to use it. Close your project in VS. Especially in big projects VS tends to freak out when merging using the UI. Do the merge in command prompt. Then open the project in VS and go to Team Explorer -> Branch. Now there is a message that says Merge is pending and conflicting files are listed right below the message. Click the conflicting file and you will have the option to Merge, Compare, Take Source, Take Target. The merge tool in VS is very easy to use. I follow the below process. As you get the latest from the destination, now resolve the conflict manually in IDE by deleting those extra characters. Do a git add to add these edited files to the git queue so that it can be commit and push to the same branch you are working on. As git add is done, do a git commit to commit the changes. This is it and you will see it resolved in your pull request if you are using Bitbucket or GitHub.